A joint program with the Neversink Association, author Leslie Sharp will talk about her book, The Quarry Fox and Other Critters of the Wild Catskills. The first in-depth study of Catskill Wildlife since John Burroughs, Sharp weaves her experiences with the seasons, plants and creatures with the natural history of each organism. Books will be available for sale and signing. It’s our opening weekend! Join us and explore our newest exhibition showcasing watercolor paintings of scenes located within the Catskill and Delaware watershed areas. Enjoy tours of the museum and the interactive Lost Catskill Farm. Fun activities for kids and light refreshments for all will be provided. Go back in time to dairy farming in the 1930s – learn how to hand milk a cow, make ice cream and butter, how milk was kept cold and transported before electricity and more. Sullivan County Dairy Ambassadors will be on hand to answer questions. Live animals! The Catskill Readers Theatre gives a lively performance to honor the decade that changed America through music and song, power point, literary selections, historical facts and points to ponder. How did the USA get into a war with Spain that neither the President, Congress, business leaders nor Spain wanted? Join Charles Breiner of Claryville to learn about the role of Theodore Roosevelt before and during the war, and why the Battleship USS Oregon captured headlines for 67 days. The unintended consequences of the war that lasted well into the twentieth century will also be discussed. The Mountain Athletic Club (MAC) of Fleischmanns will face off with the Atlantic Base Ball Club of Brooklyn for a double-header of 1864 and 1895 rules base ball. “These are no ordinary ball games,” states Collin Miller, captain of the MAC. “The players and the style of play will resemble what your great, or great-great grandparents would’ve seen over 125 years ago.” Displays featuring local nineteenth-century ball clubs included. Refreshments and souvenirs available for purchase. The Rondout Neversink Stream Program will present a short history of community interactions with local rivers and their lasting impacts, as well as a review of how we harness the value of our creeks and streams today. The talk will be followed by a tour of the water-powered shop and riparian area exhibit at the 1930s Lost Catskill Farm behind the Museum, built in a partnership among the Stream Team, Time and the Valley Museum and Tri-Valley Central School conservation students. Have conversations and reunions while viewing rich collections from Claryville and the Town of Denning that bring life to the history of the Upper Neversink and Upper Rondout valleys. Included in the afternoon are collections from two Denning families, “What’s New at Town Hall” as well as an option to ask for help with personal research questions. Town of Denning Historian, Tom McGee will be on hand with his growing collection of digitized documents. We welcome the sharing of any items relating to the Claryville or Denning area. Hand embroidery is an ancient custom but ever popular for projects of all sizes and styles. Join Phyllis (Penny) Coombe and friends to learn basic embroidery stitches including stem/outline, French knots, straight, back stitch, fishbone, and satin while making this picture in a four inch hoop that serves as a frame. You will be prepared to tackle many types of future projects. No previous experience is needed. Registration one week prior to the class is required. 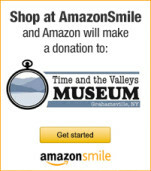 Please call 845 985-7700 or email info@timeandthevalleysmuseum.org. Bring a small, sharp pair of scissors if possible. Photos, records, stories and artifacts from the town of Neversink. The afternoon includes a special program: Catskill Bog Land by Michael Kudish, Ph.D., Professor Emeritus of Paul Smith’s College Division of Forestry. Dr. Kudish has sampled hundreds of bogs in the Catskill area, and will talk on his interesting findings from several local bogs.